If you like this article Del.icio.us it! Please leave comments, feedback, and suggestions here and subscribe to our RSS feed to keep up with the latest search engine news. Update: We are Now Multilingual! While we wrote a 300+ page book about SEO, only a dozen pages are needed to cover how to do SEO for a blog. Why? As search improves, Google and other search engines collect more data, which allows them to recommend and rank blogs based on how well people trust those blogs. If a Google user subscribes to your blog how much can Google trust that person's attention and subscription as a sign of trust? How long have they subscribed for? How often do users interact with your site? What other sites do they subscribe to? What other sites do they interact with? How regular are their search and email habits? If another blog links to you, how much should Google trust that link as a vote to help your site rank better? Do any popular and trustworthy blogs link to that site? How many people subscribe to their RSS feed? While services like Bloglines or MyBlogLog are able to answer some of these questions, Google can answer them more precisely than any other company. In addition to the above data, Google knows how old your site is, how steady you have produced content, and how steady your link profile has grown. RSS and feed readers make it easy for readers to subscribe to every post you write, and be notified the moment you publish it. Many people who read blogs also write them, and many of them have hundreds or thousands of subscribers. If a few reputable bloggers syndicate your story it can have a cascading effect where many of their readers share your story. Popular blogs that solicit reader feedback may have dozens or hundreds of comments on each post, adding unique content which the page can rank for. Optimizing a blog is more about capturing attention and getting credit for spreading ideas than it is about optimizing page copy to match search relevancy algorithms. Services such as TypePad, Blogger, and Wordpress.com allow you to host your site as a subdomain off of their sites. Do NOT do that! Some of those services offer a limited set of features and/or prohibit placing ads on your site. It can take months or years to build an audience. Rather than eventually moving your site away from one of these services, you are better off starting with your own domain name and hosting it with a reliable web host. You can register your own domain name for less than $10 at GoDaddy.com. Dreamhost is an affordable web host, and they offer one click install of the Wordpress blogging platform. A wide array of free and paid keyword research tools exist. 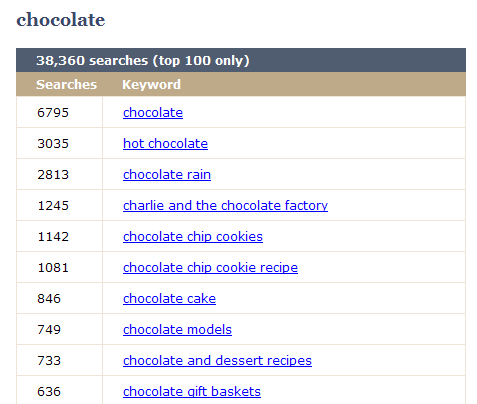 Many of these tools, such as Wordtracker, have traditionally return keywords that people recently searched for. As a blogger, you are not only looking for what is historically popular, but also what is fresh. You can gain insights into what is going on right now by performing searches on Technorati, Google Blog Search, and Google News. Services like Google Trends and Yahoo! Buzz Index show you what searches were popular in the last day. It is crucial to use your keywords in your page title, preferably near the start of your page title. You may want to use your keywords, related phrases, and popular keyword modifiers in your page content a couple times, but with an emphasis on writing natural. Make sure that your content reads well to humans, as that matters much more than what a robot thinks of your content. If people like your content and link at it that is more valuable than getting on page optimization down perfect but sounding robotic in the process. What ideas are spreading today? Who is at the center of the conversation in the blogging world? TechMeme and TailRank highlight recent popular blog posts. Spin off topically oriented meme trackers are also available. The World Bank launched their BuzzMonitor as a free open source software program allowing anyone to create a meme tracker. YouTube lists today's most popular, today's most discussed, and today's favorite videos. Many of these are irrelevant to your site, but any of these could help you find ideas that have already displayed some level of social proof. The Digg homepage, Del.icio.us Popular list, and StumbleUpon Buzz show ideas that were recently popular amongst social bookmarkers. Pligg makes it easy to create niche social news sites. You don't have to track everything to be successful. You only have to compete in your market. If you read a dozen or two dozen blogs in your market, track who is getting linked to, and why people are talking about them, that makes it easy for you to identify and create ideas and content worthy of being mentioned. It is easy to subscribe to competing blogs in your marketplace by using feed readers like iGoogle, Google Reader, or Bloglines. 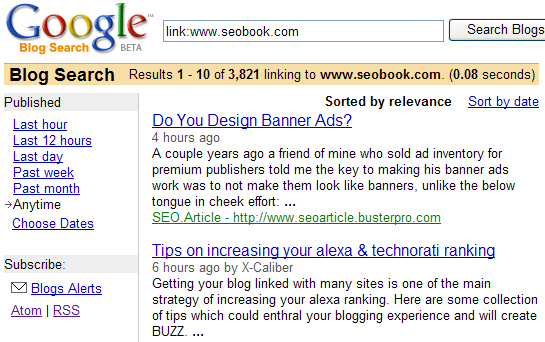 You can view links pointing at competing blogs by using Technorati or Google Blogsearch. Use the above mentioned popular lists to find out why ideas are spreading in related markets and past ideas that worked. From doing that research, it should be easy to tie those ideas to your own market to create remarkable ideas. Every piece of content you come across (online reading, books, pictures, magazines, conferences, personal experience, etc.) is a source of inspiration. Carry a camera and a notepad everywhere you go. You can keep up with general blogging trends by reading Darren Rowse's ProBlogger and Performancing. Write headlines as though you are a wire service writer. Descriptive headlines help put your story in context, and make people more likely to click on your site when it appears in search results. You can also aim to be emotionally captivating with your headlines by using your headline to ask a question or to promise solving a problem. Brian Clark offers many successful page title formulas in his Magnetic Headlines series. Until September of 2007 my homepage was the most recent posts from my blog. While that helps to promote new posts on the blog, it is off-putting to people new to my field. If you create a popular blog, make sure that your homepage is appealing to people new to your field. Guide them through the learning process, show them where to start, and highlight your best content. If your site grows into a business re-invest to create tools, add forums, and other interactive features that keep people coming back to your site. Many blogging systems allow you to highlight your most popular posts. Featuring your greatest hits puts site visitors one click away from your best content, and places more link equity on the best posts, which makes people more likely to find your site by reading one of your best posts. Many of your readers are new to your site. Referencing some of your older articles allows them to understand your frame of reference without requiring you to write the same thing over and over again. If you syndicate content to other sites or if any spammy sites steal your content, referencing old posts increases the chances that you get free links, which will help you rank better. Update: Given that the Wordpress core does a better job of redirecting duplicate URLs to the original version of the post and Google's duplicate content filtering is more sophisticated that it was when I originally published this article, I would say that most bloggers do not need to worry much about duplicate content issues. Place any piece of content in only one category. Use the Wordpress more feature to only show a small portion of your post on category pages. Use robots.txt to block date based archives and other noisy/duplicate sections of your site. Joost de Valk offers more Wordpress optimization tips in his Wordpress SEO guide. Create categories that are well aligned with industry related keywords. Doing this will create a site structure that helps those category pages rank well for the keywords in them. If your site is focused on weight loss, then creating categories about exercise, diet programs, diet pills, and weight loss supplements make sense. If you use both category and tag pages try to not let them overlap. For example, you would not want to create a category page named link building and then tag many of your pages with link building as a tag. It also helps to limit your use of categories to a dozen or two dozen categories at the most, instead of having hundreds of categories and tags with only a few posts in each. Many blogs link to the previous and next posts on each page. These links are convenient from a usability standpoint, and they help search engines crawl deeply through your website. Some Wordpress plugins list related posts under the current post, which helps readers find related material in case they land on the wrong page. Many blog content management systems place the site name ahead of the post name in the page title of individual blog posts. It is best if your page titles start with the most relevant information first. There are numerous Wordpress plugins that make it easy to change the structure of your page titles. A couple popular ones are all in one SEO pack and SEO Title Tag. If you know the types of people who reference you AND why they are referencing your site, it is easy to create additional linkworthy content they will like. If you know what your site ranks well for, then you know what topics your site is trusted for, and what related topics you should easily rank for. Some bloggers tweak high traffic pages to add keyword modifiers to the page content, which helps them get a bit more traffic by ranking for additional keyword phrases. Google Analytics is free. I also like Mint, which costs a one time $30 registration fee per site. Performancing and MyBlogLog offer analytics programs geared toward bloggers. Many people let fears control their actions, but most successful people are guided by intuition and instinct more than fear. Nobody likes a bully. Some bloggers are worried about getting sued or offending somebody. When I got sued my name, exposure, and profits grew overnight. That is not to say you should be reckless, but illegitimate lawsuits garner media exposure and organic trust. Creative destruction is part of business. In a few years people will pay to give away information that I sell today. Business people are worried about defending their copyright, but as the web gets more competitive we are fortunate to even garner enough attention to get copied. Some self-proclaimed ethical bloggers play good cop bad cop in their marketing. In this viral video tips blog post, Michael Arrington commented about how he was disgusted by it. He could not have been too disgusted by it, given that he published it on his own site, and those pageviews made him a lot of money. If you are new to internet marketing, read Seth Godin's Purple Cow to understand how to create remarkable ideas. Links are nothing but a citation. If you are remarkable the links will come, but not without a little push marketing first! Most new information is spam and/or regurgitated drivel. As more spam is created using increasingly sophisticated tools, readers get better and faster at discerning information quality at a glance. Using a default Wordpress design might turn off readers. If you use a good looking template or buy a professional custom design that shows that you care, and you are willing to invest into building your site. Formatting and design improve credibility. Being easy to contact, listing your business address, and publishing a unique well thought out about page listing your credentials makes it easier to trust your website. We are more receptive toward marketing messages that match our biases and interests. You can't get any more relevant than talking specifically about a person. Many bloggers track who links to them and read those posts. Linking out to other useful related websites is one of the cheapest forms of marketing available. Don't just link to another blog and blockquote it, but make sure you add value by explaining why you think they are right or wrong. Perhaps consider asking for feedback from a person you respect or ask them if they are willing to do an interview. Search engines view links as a sign of trust. If you can afford it, I recommend listing new blogs in authoritative general directories, niche directories, and blog directories. Here is some background information on submitting to general directories, and Loren Baker recently posted about the best blog directories. Exposure leads to more exposure. Spending a few dollars on advertising today might mean that your blog gets popular a few months earlier. Pay per click ads enable you to buy relevant traffic from search engines. AdWords has a large publishing partner network called AdSense. Buying site targeted AdSense ads and Blog Ads allow you to target your ads to specific related content sites. Review networks like ReviewMe let you to buy reviews on popular related blogs. StumbleUpon ads bring visitors to your featured articles for a nickel a click. People almost never make decisions independently — in part because the world abounds with so many choices that we have little hope of ever finding what we want on our own; in part because we are never really sure what we want anyway; and in part because what we often want is not so much to experience the “best” of everything as it is to experience the same things as other people and thereby also experience the benefits of sharing. Due to this group-think nature of decision making, many things remain popular only because they are already popular. Comments: If your site gets many comments people will be more likely to participate in the discussion. You can bold your "leave a comment" line or feature recent comments in your sidebar to encourage more comments. Replying to comments makes people more likely to leave additional comments. Some bloggers partner up, commenting on each other's stories to help make their blogs look more active. Subscriber stats: If you have hundreds or thousands of subscribers you may want to publicly display those stats. Borrow Authority: Ask authoritative people in your industry for feedback or input on a project prior to launching it. If they feel ownership in the idea they not only lend credibility to it, but they may also help you market it for free. Publicize Your Publicity: If you or your blog were featured in the mainstream media displaying a "as seen in" section on your site helps build your authority. People read blogs because they would rather read them than read a whole book at a time. Including pictures and video in your blog posts, and breaking up big chunks using bulleted lists makes it easier to consume (and share) your site. Today there's the explosion of choice brought on by the Internet. All entertainments are approximately one click away. The search-cost of finding another artist whose music or books or movies are as interesting as yours is dropping through the floor, thanks to recommendation systems, search engines, and innumerable fan-recommendation sites like blogs and MySpaces. Your virtuosity is matched by someone else's, somewhere, and if you're to compete successfully with her, you need something more than charisma and virtuosity. You need conversation. In practically every field of artistic endeavor, we see success stories grounded in artists who engage in some form of conversation with their audience. JMS kept Babylon 5 alive by hanging out on fan newsgroups. Neil Gaiman's blog is built almost entirely on conversing simultaneously with thousands of readers. All the indie bands who've found success on the Internet through their message-boards and mailing lists, all the independent documentarians like Jason Scott, comics authors like Warren Ellis with his LiveJournal, blog, mailing list, etc. Community forums tend to have large traffic streams. Participating in popular discussion forums can help get your name out there. Community forums are a great place to look for content ideas. If people frequently ask a question in forums then similar questions get asked in search boxes. Writing guest articles for popular websites allows you to tap their brand equity, user trust, and traffic stream for free. Some bloggers host blog carnivals to build exposure and link equity. Leaving relevant useful comments on related blogs might lead to that blogger subscribing to your blog, and other people clicking through to your site. Having a consistent original bias and voice makes it easy for others who share your biases and worldview to trust you and spread your message. Most (perhaps all?) popular political blogs are heavily biased. If your site immediately places AdSense ads above the content it is going to be nearly impossible to build momentum and take marketshare from trusted leaders in your marketplace. If many people read and trust your website, then Google is more reliant on you than you are on them, which makes it harder for Google to penalize your site for fear of the negative publicity they would earn for doing so. This presentation highlights why gaining attention is so crucial for blog growth in a competitive marketplace. The basics of SEO have been published many times in many places. 4 free spots to start learning SEO are SEO Basics Knol by Aaron Wall, Blogoscoped: The Basics of Search Engine Optimization, SEOMoz: The Beginner's Guide to SEO, and Dan Thies' SEO Fast Start. If you do not mind paying for online classes then our SEO training program should be able to help you learn in an interactive environment where you can ask us questions directly. We blog about SEO and internet marketing here, and Lee Odden has a big list of 400+ blogs about search here. Subscribe to our RSS feed to keep up with the latest search engine news.